A Stoughton, Massachusetts, man received quite a surprise while checking underneath the hood of his car on Saturday morning: a boa constrictor curled up on the engine. Multiple officers, as well as animal control, responded to the scene on Seaver Street, according to Stoughton police. 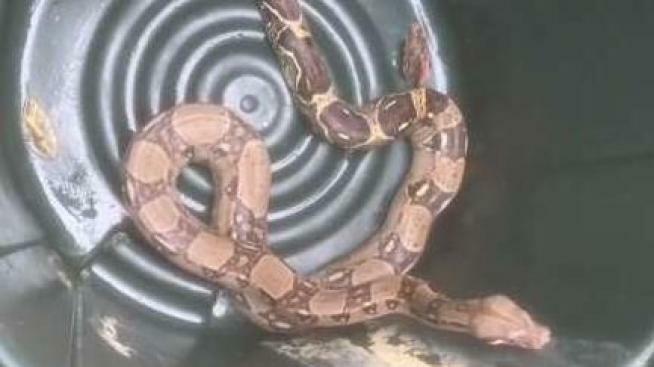 The snake was safely captured without any harm to officers, the car's owner or the boa. "I popped the hood on my truck just to check the fluids, and he was coiled up on my engine," said Joe Reed, the man who received a visit from the serpent. Reed first spotted the snake in his trash can about 10 hours earlier and it had scurried away. "He was stretched across the trash cans we have outside here," Reed said of the first encounter. "It kind of scared me then. It scared me both times." The snake was reunited with its owner by Saturday night. The owner, who did not want to be identified, will not face any penalties for losing the snake.